September 26, 2017. 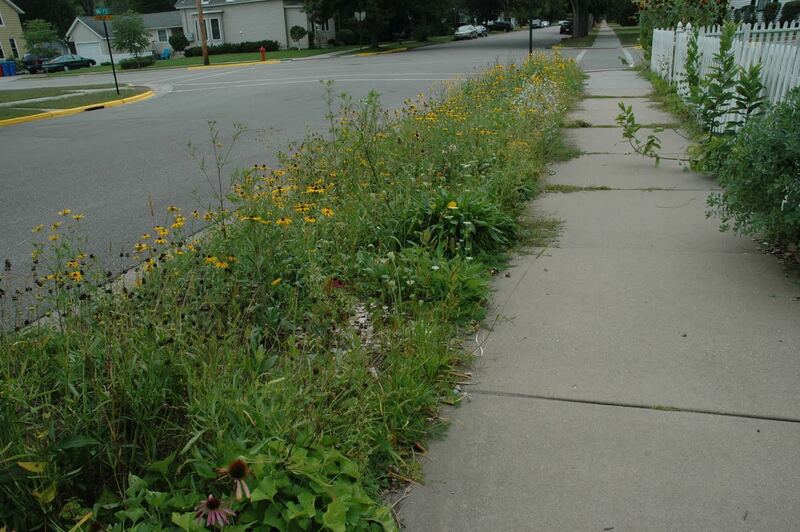 Last summer my neighbor and I conspired to turn our shared boulevard (the strip of land between the sidewalk and the street in our Winona neighborhood parlance) from a crabgrass herbarium to a prairie. We covered the sod in plastic to solarize the vegetation, then turned it over, burying the mostly dead weeds. Finally in late fall we sowed a short statured prairie mix which had been recommended for city use—the plants would not grow so tall as to frighten the neighbors. Come spring, not much happened. A lot of weeds returned, spurges and queen Anne’s lace the like, but we didn’t see any sign of the prairie plants we had been hoping for. 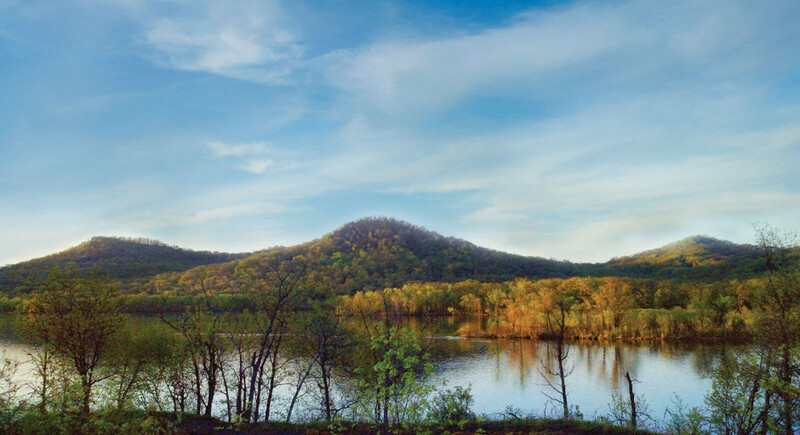 When I asked Kim about this, he said to be patient—it takes up to three years for a prairie to establish itself. 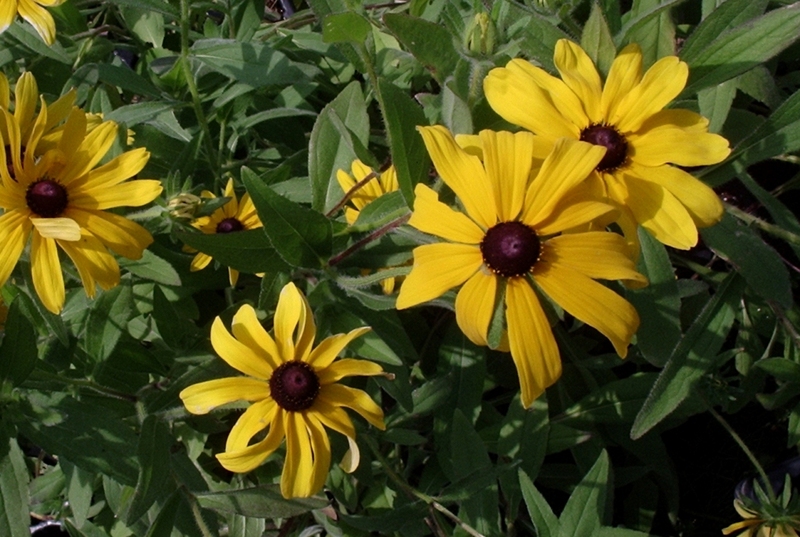 We were about to give up when, mid-summer, suddenly we had a plethora of black-eyed Susans and our weedy boulevard was transformed into a riot of yellow blooms. Jim’s prairie displaying the yellow of black-eyed Susans less than a year after it was seeded. Untidy for some, but rich in resources for others. Photo Jim Armstrong. 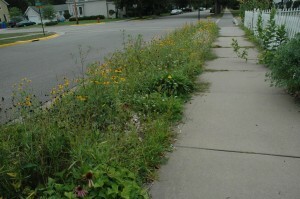 I have included photos comparing the boulevard prairie to the standard Winona grass boulevard. Looking at them, you might prefer the grass version: so much more neat and tidy. Our nascent prairie is a confusing welter of vegetation (and there is a rather intrusive milkweed on the right which is actually obstructing traffic—I tied it back with twine). 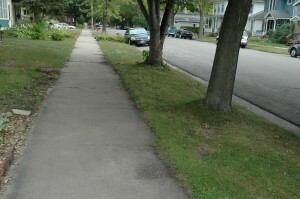 The grass boulevard is also easily traversed by those who park their cars by my house and wish to access the sidewalk. 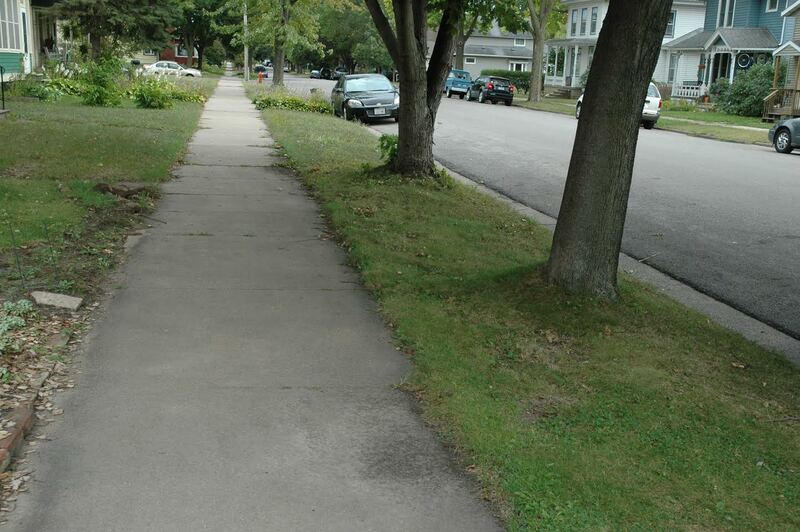 One can certainly see why the city has regulations about care and upkeep of these spaces. However, the grass boulevard is a desert. Its abstract sameness (so convenient to humans) is of no use to any other species. One of the reasons my neighbor and I wanted the prairie is that we are concerned about the plight of pollinators. Once you see your personal landscape as a shared space with other species, you begin to have a different aesthetic. What I see when I look at the untidy prairie space I’ve created is the intense activity it supports: bees, birds, butterflies all visit regularly to harvest its nectar and pollen. For example, I have seen goldfinches perched delicately on my black-eyed Susans—a brilliant yellow-and-black bird swaying atop a whorl of yellow petals, pecking seeds from the black center. My urban space is a source of nourishment and sensual delight, not just a monochromatic mat board with which to frame my house. Another factor to consider is the effort involved. My prairie is very low maintenance. Once it fully gets going I will only have to cut it once a year. Because it is used to extremes, I don’t have to water it or replenish nutrients by fertilizing it. My grass boulevard, however, has to be regularly groomed and wetted.